Close your eyes and visualize swaying back and forth in a hammock. If you’ve ever laid in a hammock, the toughest part is getting inside, right? Once you’ve made the initial step and resting, there’s no fear of falling, right? It’s 100% chill time. There’s no tension in the body, it’s in a complete state of relaxation. One side of the hammock isn’t securely anchored? Suddenly your body goes into panic, attempting to re-organize itself. Your body stiffens and panic begins to set in because of your body’s innate fear of falling. And all it takes is one side of the hammock coming loose which creates total chaos! And the same goes for the rotational sport of baseball. To effectively rotate your hips.. you must securely anchor both sides of your body. Whenever you’re upper and lower body are not secured, or fixed, there’s no way possible for your body to rotate. That’s why I’m always stressing my pitchers to “Think Like A Hammock”. 99% of all amateur pitching mechanics “leaks” can be traced back to the eyes or the feet! Anchor your eyes and feet! Because it’s the players who can securely anchor both ends and sway through the middle who are the same ones lighting up the radar gun and dropping bombs. Struggle with arm action efficiency. But nobody ever thinks about it this way do they? Instead, the discussion centers around the working parts versus the entire system. If you can’t breathe effectively, you can’t move efficiently. Breathing is a learned skill that allows us to turn off movements (inhibit) versus turning on movements (activating). And that my friend is the difference between your expert movers versus your novice movers. It’s the invisible bridge between the mental and physical game. (Copy and Tweet This!) . Here’s a simple example of inhibiting movement that’s pretty important to hitting or pitching: Try rotating only your hips and while preventing your shoulders from turning… can you do this? Your body is built to follow your eyes. Wherever your eyes go, your body is sure to follow. In fact, the eyes are Public Enemy #1 to your hips and lower body. I’ll explain why later in the article. The key to ground force production is based on your ability to stabilize your feet to the ground. The key is connecting your whole foot to the ground, not just the heel! Whenever weight shifts to the ball of your foot, you activate the quads and end up pushing your lower-half, preventing any chance for hip/shoulder separation. Whenever weight shifts to the heel, you prevent your back hip from rotating and your front hip swings open out of sequence. The feet are the primary reason so many pitchers suffer from the “Inverted W” and “High Elbows”… These issues are directly related to the feet. Why Don’t More Pitching Coaches Talk About The Importance of Anchoring Both Sides of The Kinetic Chain? Why aren’t pitching coaches starting with the eyes and feet when discussing pitching or hitting mechanics? Why do we spend so much time training hip/shoulder separation without ever mentioning how the hips/shoulders are affected by the feet and eyes? Their brain is detached from their hips. They have no FEEL for their hips due to a lack of hip proprioception. What happens in the beginning affects the end. What happens on the right affects the left. What happens on the bottom affects the top. And regardless of how much power we are able to generate from the legs…It’s all for nothing if we are not able to connect the power and energy created by the lower-half and transfer it to the upper body. You are only as strong as your weakest link and ALL Roads Cross Through The Center! So, let’s think of the hips in a different manner, shall we? Let’s view them as a fuse box. The center of your body is ground zero for hum an movement . There’s not a single move you could make in this game that doesn’t originate from the middle of your body. Energy DOES NOT START from the ground up! Yep, sorry to break it to you but that’s a myth. The only way to create ground force is by driving into the ground and try driving force into the ground without engaging, dropping or hinging at your hips. Don’t believe me… Try it yourself. Stand still and see how much force you’re able to drive into the ground without bending or hinging at the hips. Ground force production and energy transfer originates with middle of your body moving down. The energy then rebounds or redirects back up through the kinetic chain from your feet up to your fingertips. Unless of course, the energy is lost due to ‘leaking hips”. Regardless of how much energy or power you’re able to generate from your lower-half, it’s all for nothing if you’re unable to connect it to the upper body. Most of you reading this right now have probably been told you could be throwing much harder, if only you generated more from your lower-half, but really that’s only part of your problem. The real key to building high level mechanics and throwing harder with less stress on the arm is dependent upon? Your ability t o move efficiently through the center of your body! Alright, I know I”ve dropped a bomb on you and you’re trying to wrap you head around this stuff. So, here’s something that will click for you. Ever been told that a longer stride increases your velocity? Both guys efficiently use the middle of their body to move faster while mirroring the slope of the mound. Because they move faster and more efficiently they generate greater momentum which lends to a longer stride. Because they move faster and more efficiently through their middle, they give their arm no choice but to move faster and more efficiently. Basically, the hips are giving the arm the impression that “it’s running out of time” and it better get from point A – B faster. Here’s a great video from Paul Nyman at Pitch-a-Palooza 13. Paul is the owner of www.Setpro.com and I HIGHLY RECOMMEND you spend time reading over the info on his site. Sadly, most of the players who fly in from all over the world to work with me, do not possess the overall awareness levels to move efficiently through the center of their body. In fact, 75-90% of them even struggle being able to rotate and move their hips without turning the shoulders, or shifting the weight away from the center of the foot. And that’s a major problem for a several reasons. It tells me they lack the hip awareness necessary for efficient mechanics, which Dr. Sills discussed earlier. Secondly, they aren’t able segment rotation while standing still… So how could they do this while moving on one leg down a hill? If your feet are moving with the hips, how could I expect you to rotate without a fixed point? I couldn’t. I wouldn’t. I don’t. Honestly, I’m betting most of you reading this are in the same boat. You’re wasting your time training symptoms and never addressing the real cause. And it’s why you’re not seeing velocity gains transfer to the mound as well. Like so many pitchers out there, you’ve been told your real problem is your lower-half or that you’ve got to get stronger. So, you do exactly what I would have done many years ago. You head to the weight room or pick up weighted balls hoping to get your body and arm stronger, but you don’t see the velocity gains transfer to the mound, right? Don’t get me wrong… I’m a big proponent of lifting and weighted balls. But, I strongly feel those are only a single piece of the puzzle and both are irrelevant if you lack basic body and hip awareness. Strength is a necessary componenet, but it ‘s also secondary to efficient movement . If arm strength was truly the key to higher velocity, why are you able to throw harder from the outfield versus the mound? If Olympic lifting was the key to velocity gains, why aren’t MLB rosters dominated by Hockey players or Eastern Europeans? Because the real secret to velocity gains that transfer to the game mound is arm speed, not arm strength. 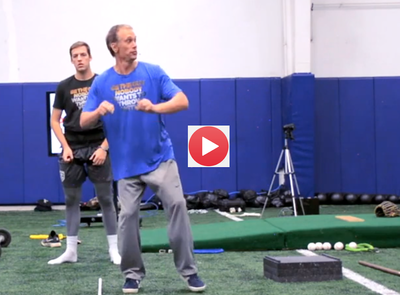 Once you learn to move faster and more efficiently through the center part of your body, you’ll give your arm no choice but to make a cleaner, faster and more efficient path to release. There’s a reason The Core Velocity Belt is being used daily by over 480 college programs and 25 MLB organizations…. Click here to order. P.S: Come train with me this summer at one of my 3-Day Core Velocity Training Programs. Click here to find one of the programs that has not already sold-out.